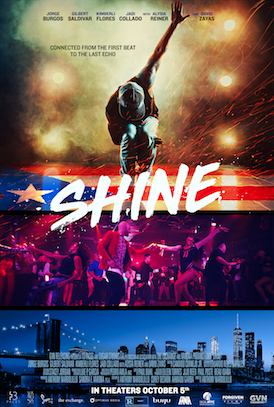 Forgiven Films, a division of GVN Releasing, launched the first full-length trailer and film poster for "SHINE" on August 21. The Latin dance drama stars "Dexter’s" David Zayas, "Orange Is the New Black’s" Alysia Reiner and world-renowned dancers Gilbert Saldivar as well as Jorge “Ataca” Burgos. The film will be released in theaters nationwide on October 5. "SHINE" won the audience award for best feature at last year’s Urbanworld Film Festival. The story revolves around two brothers (Saldivar and Burgos), once celebrated Salsa dancers, who are separated after a tragedy only to be reunited years later on opposing sides of gentrification. The film was directed and written by Anthony Nardolillo, via his 13 Paces Productions and produced with Sandra Varona of Varona Productions, in partnership with Sugar Studios LA and The Exchange. "SHINE" is being distributed by Forgiven Films, a division of GVN Releasing. Two Puerto Rican brothers, Ralphi Matas (Jorge Burgos) and Junior (Gilbert Saldivar), from New York's Spanish Harlem and the street’s best Salsa dancers, are separated after a tragedy only to reunite years later on opposing sides of gentrification. Created as a division of GVN Releasing, Forgiven Films is a global independent distributor with a broad focus specializing in content for underserved audiences and quality independent films for both the theatrical and home entertainment markets. Its first two releases SHINEand A Violent Manwill hit theaters in 2018. For more information, visit gvnreleasing.com. GVN is an independent distributor of crossover micro-targeted (urban/women/faith-and-family) feel good content. With its seasoned and sophisticated executive team having over 30 years of combined experience in the entertainment industry, the company excels at the acquisition and exploitation of feature films suitable for theatrical, physical, digital, and television distribution. GVN deploys their multi-platform distribution strategy for independent films that have significant social media relevance to the micro-targeted demographic. For more, visit gvnreleasing.com.